The bounty of my garden this summer is over flowing with lusciousness. Mostly an enormous amount of deep red roma tomatoes in need of a yummy recipe. 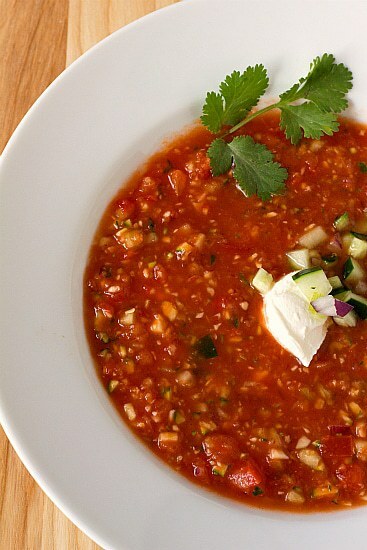 With the temperatures consistently close to 100 degrees for the last month I searched my cookbooks for a cool, refreshing gazpacho recipe and I found one I’d like to share with you. For the most part, I’ve incorporated a variety of recipes to create my own. Besides, it’s not difficult to make. Family and friends seem to like it. I hope you do as well. plum tomatoes ~ about 2lbs. olive oil ~ ¼ C. – 1 Cup ~ in other words, to taste. One by one, put into a food processor. Blend until coarsely chopped. DO NOT OVER PROCESS. Personally, I like it a little chunkier in texture. After each vegetable is processed, combine into a large bowl. Add everything else from the Garlic to the Optional ingredients. Let chill. The longer it chills, the better it tastes. **For a some extra yummy goodness, top with one or all of the following: avocado, cilantro or parsley, a splash of tequila, lime juice, extra olive oil, and sour cream. Serve with some delicious bread and you have a wonderful summertime meal. If you’re anything like me you’ll tweak the amounts of each ingredient to your liking. Keep track of what you do, that way you can make it again and again. Food is a wonderful catalyst for writing. Let your senses dine with you. Write it out. Share here!